Marin Magazine gave me a wonderful opportunity in the February issue — eight pages of photographs to illustrate the beauty of Marin County. 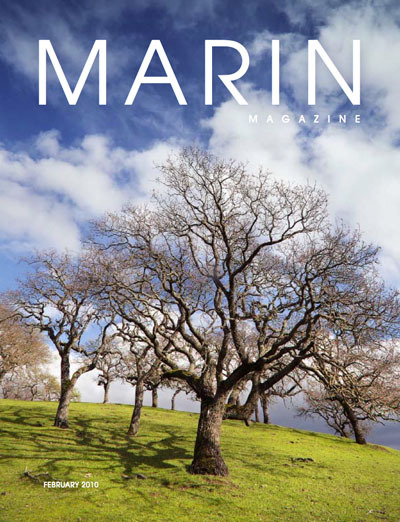 To my surprise, the editor also chose one of the images for the cover — a grove of oak trees on a Novato hillside. I made this photo quite by accident a year ago. I was looking for an elevated vantage point to photograph the Buck Institute’s distinctive I.M. Pei building as part of a story on Buck’s scientists. As I climbed this little hillside with my gear, the sun suddenly came out from behind some storm clouds and lit up the grass and the trees. I shot about 10 frames before the cloud cover returned. Another shot from that moment is in the photo layout. The text I wrote to accompany the pictures is below. See all the photos in a slideshow. And, of course, they are available for purchase as fine art prints through the Marin Store. Much of my career, in photography and in journalism, has focused on people and their peccadilloes. They were rogues and rascals mostly, types you wouldn’t readily invite home for family dinner. Such was the business of news. 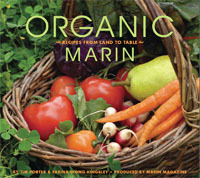 That changed when I began making pictures for Marin Magazine. Even though we have our share of local rapscallions, what captivated me as I ventured deeper into Marin than ever before were its various scapes—landscapes, seascapes, and, yes, bridgescapes. I was often out and about at first light or early evening, when nature presents its very best. The beauty of this marvelous place filled me with wonder—the forested wilds of Tam, the windswept solitude of the beaches, the verdant promise of spring farmland, all of it connected, majestically, by a golden span to San Francisco. This entry was posted in On the Job and tagged Buck Institute, Marin Magazine, Novato, Oaks, the Marin Store.